Company Setting Industry Standards of Quality, Reliability and Performance with More Powerful Engine. Honda Marine introduces the all-new BF250 horsepower (hp) four-stroke engine, the most powerful outboard to join the Honda Marine lineup – and now the company’s flagship model. The Honda BF250 marine outboard engine incorporates a host of Honda-exclusive technologies that provide increased value and benefit to consumers. The styling concept of the new Honda BF250, a departure from previously introduced Honda Marine outboards, incorporates a sleeker and slimmer aesthetic design. The cowling of the new engine exhibits a sharper, more angular profile – with chrome lines conveying power and speed – contributing to an overall streamlined, aerodynamic appearance. Included in this innovative and durable configuration are technologically advanced features that contribute to the engine’s best-in-class fuel economy and excellent power and charging performance. With a full-throttle RPM range of 5300-6300, the Honda BF250 is a high-performance 3.6 L engine that incorporates an all-new gear case and advancements from Honda’s automotive and marine outboard engine lines. For example, integrated into the BF250 design is Honda’s Variable Valve Timing and Lift Electronic Control® (VTEC®). First debuted in the high-performance Acura NSX sports car, VTEC® technology works to vary the lift and duration of the intake valve opening to deliver optimal performance at both low and high rpm, resulting in peak performance at all speeds. The technology provides a broad, flat torque curve and smooth power delivery throughout the engine’s entire operating range, allowing the operator to enjoy outstanding performance and impressive fuel economy. The Honda BF250 engine incorporates the Boosted Low Speed Torque (BLAST™) System which dramatically improves holeshot acceleration by advancing ignition spark timing to within one degree of the knock limit during ‘hammer down’ acceleration. The Engine Control Module (ECM) then steps in to increase injector timing, creating a more potent air/fuel mixture. The resulting boost in available torque at low rpm contributes to a strong holeshot (off the line acceleration) to get the boat up on plane quickly. The ignition spark timing is appropriately adjusted under slower throttle advancement, ensuring a leaner air/fuel mix and improved fuel efficiency. The ECM in the Honda BF250 also can predict the operator’s shifting operation based on changes in engine speed and throttle position. Further, when the electric load on the new Honda BF250 increases, an adjustable idling-charge system enhances the charging performance of the engine. The BF250 has an industry-first, AMP Plus (Amp+) feature which, at idle speeds, senses a need for more amperage and automatically raises the engine rpms by 100 to produce an additional nine amps. This is perfect for simultaneously running accessories such as SONAR, GPS, stereo, live wells and trolling motors. The all-new Honda BF250 is designed with Lean Burn Control, a feature that automatically adjusts the air/fuel mix according to speed and load while maximizing power throughout the acceleration range – providing as much as 20 percent greater fuel economy in cruise mode (2,000 to 4,500 rpm). Lean Burn Control has been enhanced on the BF250 to improve fuel efficiency even further in specific cruising ranges, resulting in best-in-class fuel economy: 16 -30 percent better than competitive models, depending on specific running conditions. The increased durability and reliability of the Honda BF250 stems from a redesigned gear case and a low gear ratio; an optional large diameter (16”) propeller also can further enhance performance. The gear case of the BF250 engine incorporates an advanced design that minimizes water resistance, and by extension, reduces the overall drag coefficient by five percent (even without the use of the larger, optional propeller). The all-new Honda BF250 engine incorporates the world’s first marine direct air dual circuit induction system of its type on a production outboard. The first circuit draws air into the front and around critical engine components, and a top-mounted cooling fan draws cooling air over the alternator. The second circuit routes cool air from the upper intake vents, removes moisture, and then inducts it into the throttle body. This system provides for cooler, denser air for better combustion than conventional under-cowl induction systems. The design of the variable air intake system on the Honda BF250 also includes a large air-intake silencer that reduces noise. The silencing effect results from a chamber being added to the intake passage – causing sound waves to interfere with one another – creating a side branch effect that quiets noise. The design of the Honda BF250 incorporates a spark plug maintenance cover that assists in ease-of-maintenance of the spark plug. This window provides access to the spark plugs without removing the entire engine cover. The engine also includes a high-quality, cost-effective nickel spark plug that seals the combustion chamber. Because the BF250 engine mounts on industry-standard 26” centers, repowering twin BF250s is convenient. Having a 26" industry-standard engine mount is an advantage in several ways. In terms of repowering, older boats traditionally utilized the standard 26" distance, making it an easy fit to repower with Honda engines that utilize the same standard. By extension, having to modify a transom to accommodate a different distance is costly. Having ample room between the two outboards allows for easier access for maintenance, and this distance provides tighter turning capability. In addition, the new Honda BF250 engine is NMEA 2000® certified (parameters of this certification are defined and controlled by the U.S.-based National Marine Electronics Association). This accreditation means that the product has been tested to meet specific critical safety criteria and to correctly implement network management and messaging. NMEA developed this open architecture electronic protocol to allow engine data to be interfaced with a wide variety of name brand marine electronics. In meeting this certification, the BF250 does not require the added expense of proprietary gateway devices. Beginning in 2012, the all-new Honda BF250 outboard engine will be available at Honda Marine dealers nationwide. All new Honda outboard engines sold for recreational use, including the new BF250, offer an industry-best True 5-year, non-declining limited factory warranty that is the same on the last day as it is on the first. Honda Marine exclusively features four-stroke outboard engine technology for high fuel efficiency, quiet operation, and low emissions. 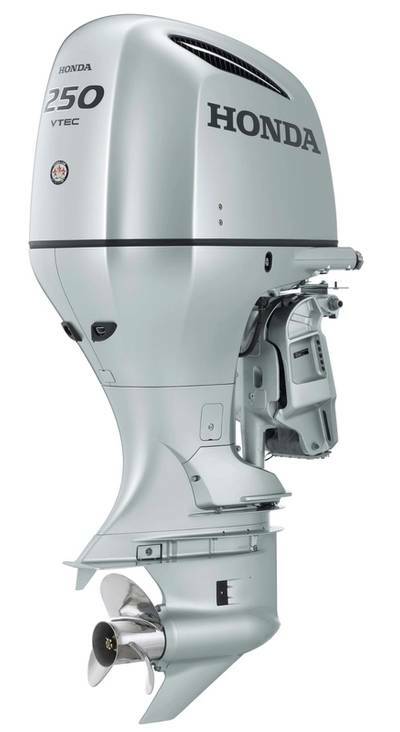 Honda's outboards share the same unparalleled durability, quality, and reliability of its legendary automobiles. With models ranging from 2 to 250 horsepower, the Honda Marine full line of current production models certify to California Air Resources Board (CARB) 3-Star standards, ensuring their availability and regulatory compliance in all 50 states.